Note: My 16 December 2015 post on Beatriz Galindo has somehow been deleted (oops! ), and although I've restored it, or tried to restore it, it may not show up in the appropriate spot in the 2015 archive! So I've reposted it here, in 2017, just in case . . .
Today is the anniversary of the birth of Catherine of Aragon, and so I thought I would post today not about the woman who would become part of Henry VIII's marital misadventures, but instead about the woman who was her tutor, the humanist scholar Beatriz Galindo, known for her scholarly proficiency and mastery of Latin as "la Latina." Beatriz Galindo's date of birth is not known--estimates range generally from 1464 to 1474. 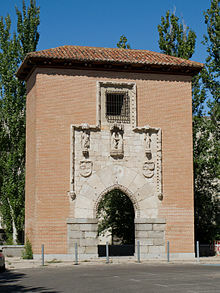 Born in Madrid, she was was the daughter of a family of the lesser nobility, and it seems that her parents intended Beatriz for the religious life. To further her understanding of the prayers, music, and ritual of the cloister, she began to study Latin, but, given her manifest gifts, she received Latin instruction at the grammar school of the University of Salamanca, where she and Luisa de Medrano were among the first female students. Galindo acquired further training from the University of Salerno, where she received diplomas in philosophy and Latin. Although the information I have is fragmentary (and sometimes contradictory), it seems that both Galindo and Medrano lectured at the University of Salamanca, Medrano in poetry and history, Galindo in rhetoric, philosophy, and medicine. Galindo is credited with having written Latin poetry and commentaries on Aristotle, though only a few letters and a will survive. 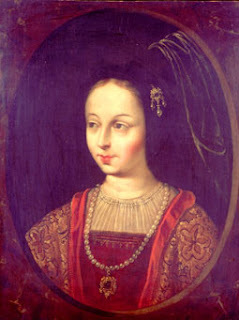 By 1486, her reputation had brought Galindo to the attention of Queen Isabella of Castile. Well aware of her own educational deficiencies, Isabella brought the scholar to court, where she would tutor the queen in Latin. Galindo seems also to have become something of an advisor to Isabella and perhaps also to have served as her secretary at times. In addition, Galindo became the tutor for Isabella's daughters, with most sources focusing on her training of the two youngest, Juana and Catalina (later Catherine). Isabella also appointed Galindo as the director of a school for the children of the nobility that the queen had established at court. Widowed after 1501, she retired from the court and dedicated herself to the foundation of charities, notably the Hospital de la Concepción de Nuestra Señora (the Hospital of the Conception of Our Lady), popularly called the hospital of la Latina. She also founded the Convento de la Concepción Jerónima (also called the Convento de La Latina) in 1509 for nuns of the Hieronymite order. 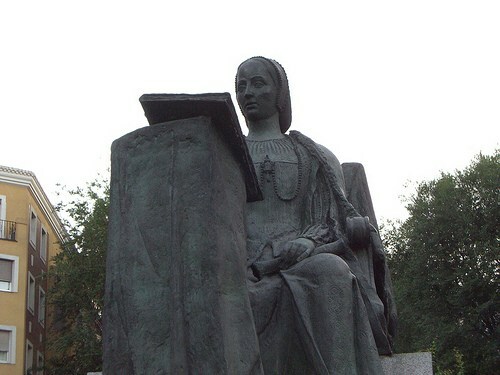 Beatriz Galindo died in Madrid on 23 November 1534. One of the most reliable sources is an article from a 2006 edition of a supplement to El Mundo, which you can read by clicking here.